Paleo Food List > Is Kohlrabi Paleo? Kohlrabi is a member of the cabbage family and is sometimes referred to as a “turnip cabbage”. The stem does look somewhat like a turnip, but the taste is more similar to one of its other siblings, broccoli, just a little sweeter. 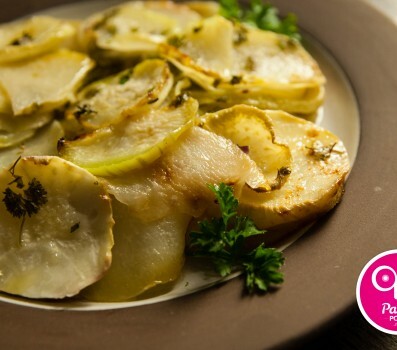 Kohlrabi contains moderate amounts of carbohydrates and a fair amount of fiber, so you don’t need to worry about the carbs spiking your blood sugar. Kohlrabi is an excellent source of vitamin C and various B vitamins, with moderate amounts of minerals such as manganese, phosphorous, and potassium. Don’t forget the leaves. Eating leafy greens is always a good idea, both in terms of nutrition and ecological concerns. By eating the leaves along with the stalks you get an extra helping of vitamins and minerals, while making sure no food goes to waste. Mark Sisson listed kohlrabi as one of his top 10 summer vegetables.